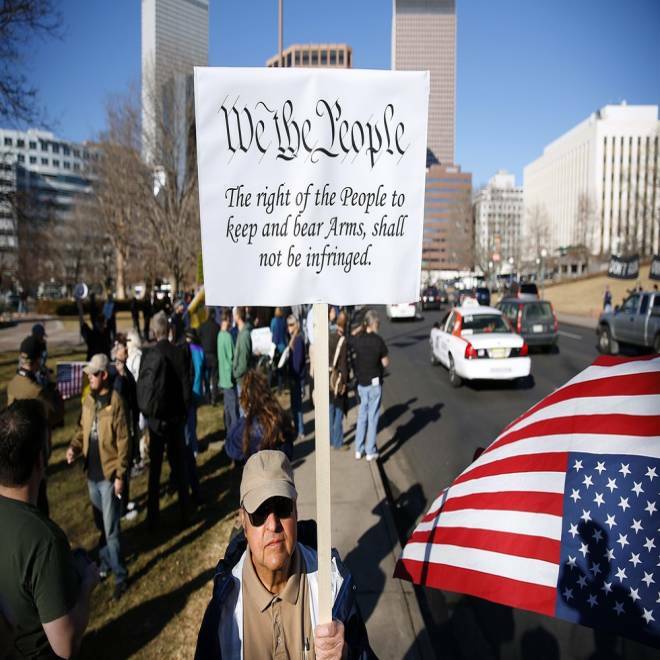 Joseph Gabriele of Littleton, Colo., protests with fellow activists in support of gun rights Jan. 9 at the state Capitol in Denver. Lawmakers are calling for tougher gun legislation after recent mass shootings at an Aurora, Colo., movie theater and elementary school in Newtown, Conn.
As lawmakers from Connecticut to California rush to propose new restrictions on firearms and ammunition, state-level gun-rights activists are playing defense for the first time in years, with some saying they face fights they may not win. In a blog post after the mass shooting at Sandy Hook Elementary in Newtown, Conn., the CCDL admitted to its members that efforts to ban assault weapons and high-capacity magazines could succeed, despite their strident opposition. The CCDL message said that "we simply do not know" whether they would be "successful in our efforts to protect us from bans on certain firearms or magazines." As the White House formulates a list of federal proposals to combat gun violence, with recommendations from Vice President Joe Biden’s task force expected by Tuesday, lawmakers at the state level are forging ahead to restrict the sale or possession of certain types of firearms and ammunition. In New Jersey, 18 new bills have been submitted to the state legislature, including one that would require gun buyers to submit to a psychological evaluation, according to the Star-Ledger. In New York, Gov. Andrew Cuomo called on legislators to pass the nation’s toughest ban on assault weapons and restrictions on high-capacity magazines. In California, which already has some of the strictest gun laws in the nation, Sen. Leland Yee, a Democrat, said he intends to introduce a bill requiring gun owners to register annually, and another requiring all guns to be kept in lock boxes when not in use. In Connecticut, Democratic Sen. Beth Bye wants to limit access to assault weapons and high-capacity magazines, and require that firearms be registered by model and serial number, Reuters reported. Bye also wants to impose a 50 percent sales tax on ammunition and magazines. In Colorado, Gov. John Hickenlooper, a Democrat, received a standing ovation from some state legislators Thursday when he suggested requiring universal background checks on all gun sales. With so many lawmakers vowing action, gun rights groups say they face a stronger tide of public opinion and political pressure than ever before. RMGO is currently running a drawing on its website to win an AR-15 – the same model of rifle police have said was used by alleged Aurora shooter James Holmes and Newtown gunman Adam Lanza. In New York, the Shooters Committee on Political Education, a gun advocacy group, struck a similar tone in a message to its membership. “Your participation is no guarantee that we will win this important fight to protect your Constitutional rights, but we can say with certainty that anything short of overwhelming our legislators with calls, emails and letters we have virtually no chance,” SCOPE told members on its website. “We will do everything we can to preserve our constitutional right to keep and bear arms, and how that turns out is anybody’s guess,” SCOPE head Budd Schroeder said. Saying that the National Rifle Association is too willing to compromise with gun-control advocates, 22 state and 5 national pro-gun groups have coalesced in recent weeks to form the National Coalition to Stop the Gun Ban. Among the national groups involved is Gun Owners of America, which claims a membership of 300,000. The coalition formed out of a desire to stand against new regulations on guns, according to Charles Heller, spokesman for the Arizona Citizens Defense League. Heller characterized renewed calls for gun control as an overly emotional response to the shootings in Arizona, Connecticut, Wisconsin, and elsewhere. Heller’s AZCDL was among the 27 signatories of an open letter the coalition addressed to members of Congress asking them to not pass new legislation banning certain firearms and magazines, or requiring background checks on private gun sales. “Members of Congress who support gun control by any means, procedural or substantive, will be targeted for defeat by coalition members,” the letter reads. Tensions among pro-gun activists are running just as high in states where legislators have remained quiet on new measures, said Paul Valone, president of Grass Roots North Carolina. In an open letter to President Barack Obama, Valone speculated that some gun owners may use violent force to resist government attempts to confiscate assault weapons. “The real question, Mr. President, is whether you so hunger for power that you are willing to foment what might be the next American Revolution,” Valone wrote. In the meantime, anxiety among hardline pro-gun rights advocates may be swelling the ranks of activist groups. The NRA told Politico that its membership grew by 100,000 in the 18 days after the shooting in Newtown.